GastroSmart™ offers intelligent and innovative solutions for gastrointestinal conditions with claims that are supported by clinical & scientific studies. GastroSmart™ range of products have attracted millions of users worldwide due to the high efficacy and stringent safety profiling. These unique proprietary blends offer a one stop solution for gastrointestinal health with a continuous stream of line extensions and product innovations for reflux, bowel regularity, bloating, diarrhea, constipation and irritable bowel syndrome. Reflux Control is scientifically proven to instantly suppress acid reflux and provide longer relief for heartburn and indigestion due to Gastro-Oesophageal Reflux Disease. 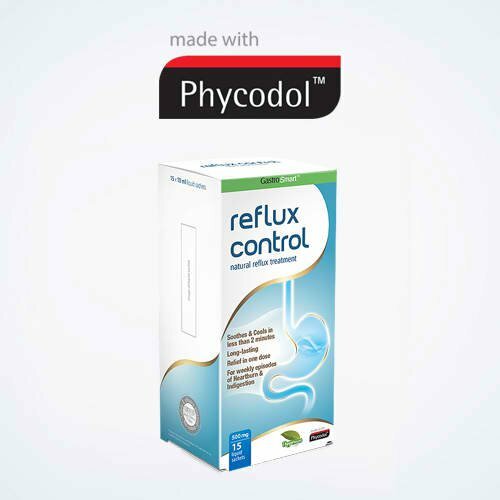 In fact, Reflux Control is the only anti-reflux gastrointestinal product that contains the proprietary nature-sourced ingredient, Phycodol™. Phycodol™ is a natural compound that interacts with the reflux (gastric juices) in the stomach to produce a protective shield that floats on top of the stomach’s lining to prevent pain and discomfort. It also prevents regurgitation of stomach contents back into the esophagus. This raft formation is rapid, often within a few seconds from the time it is taken. Phycodol™ is proven to provide onset of soothing and cooling effects in less than 2 minutes and effects last for 4 hours (faster and longer than most other heartburn treatments). Safe and effective relief for adults and children. Diarrhoea Control can effectively stop diarrhoea and support rehydration. It is a convenient treatment made with Morilyte™, an edible and natural clay. 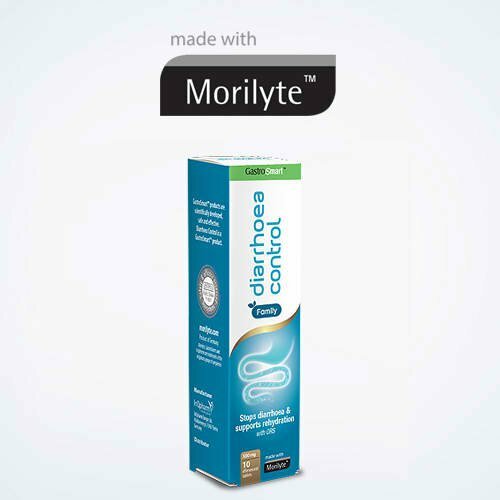 Morilyte™ also contains additional salts that are released as essential electrolytes for a faster recovery. Diarrhoea Control’s dual-action, non-drug formula can be taken by children through an effervescent tablet. Natural treatment that restores and maintains regularity. Bowel Regularity Control contains Chiasyll™, which absorbs water and can swell more than 40 times in volume to form a viscous gel that softens and adds bulk to the stools. This helps to regulate the movement of food through the intestines. 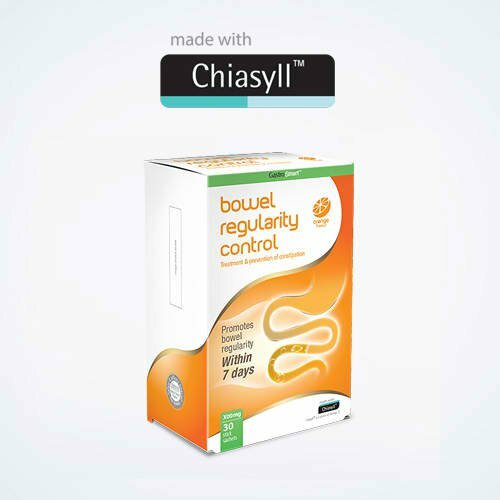 As a bulk-forming agent Chiasyll™ helps to improve the number of bowel movements, ensures that the stools are neither too hard nor too soft, and it quickens the pace that waste travels in the intestines so that it can be excreted regularly. This also helps to promote bowel cleansing and detoxification. As bodily waste is excreted more regularly, the body’s ability to defecate regularly is gradually restored. Bowel Regularity Control also helps in the treatment and prevention of constipation to kick-start a healthy weight management programme. Fast and effective treatment from constipation while being gentle on the stomach. Constipation Control is scientifically validated to provide the dual benefits of laxative and prebiotics to restore gut health and help ease defecation and soften stools by drawing water from the gut, thereby increasing water content in the stools. 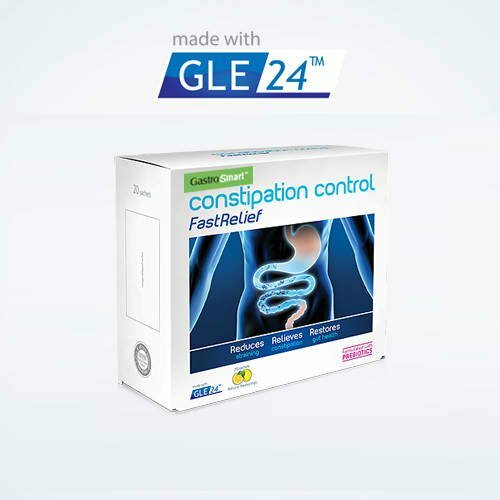 GLE24™ helps enable fast yet gentle relief from constipation without disrupting the digestive balance. Effective and fast relief from trapped wind. With Bloating Control the abdominal condition of bloating can be quickly and easily managed. 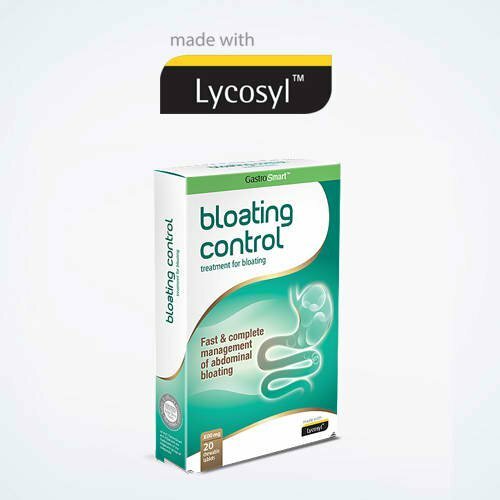 Bloating Control contains Lycosyl™, a proprietary compound that is scientifically validated to be highly effective in relieving abdominal pressure, bloating and other abdominal discomfort as well as promoting the healthy growth of good bacteria to restore gut health. The active ingredient spreads over gas bubbles and dissolves them to provide relief from pressure and bloating due to gas. It contains a prebiotic that increases the population of good bacteria in the intestine to inhibit growth of gas-producing bacteria. This restores intestinal microbalance. Helps reduce intestinal inflammation & abdominal pain. 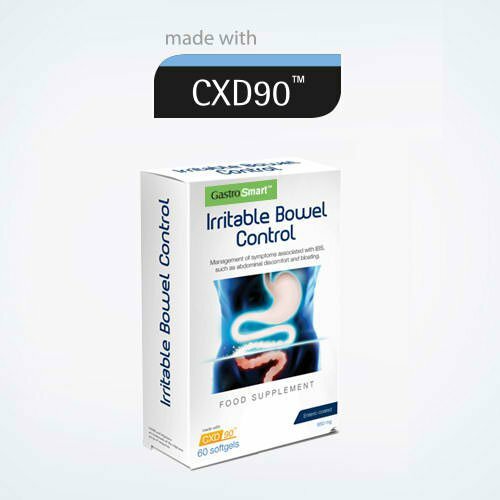 Irritable Bowel Control is made with CXD90™, clinically proven to reduce spasm and intestinal inflammation. Its unique proprietary complex of plant extracts and micronutrient helps to reduce intestinal inflammation by protecting the intestine against inflammation triggers and calms the digestive system by providing relieves from painful cramps caused by spasm. Irritable Bowel Control made with CXD90™ is proven to improve the quality of life of sufferer, relieving them from discomfort and pain.